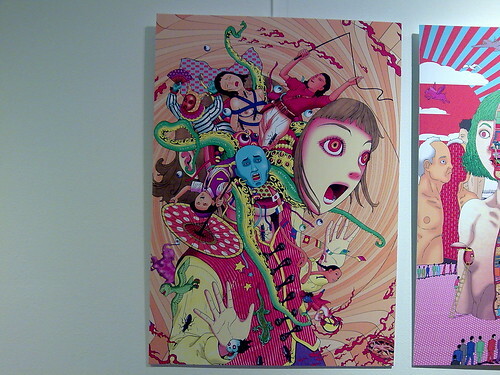 I've received our first photos from yesterday's Shintaro Kago exhibition opening in Amsterdam, courtesy of Dan. Thanks to him for sharing these great pics, so all us suckers stuck in other parts of the world can see what we missed. If anyone has more photos to share, send me an email- I'd love to post them here! Front window of the K-SPACE Gallery. "There is a good selection of his art (the Vice cover and similar prints; works mostly displayed before in Vanilla Gallery in Tokyo and used as the cover art for manga collections) and even some original pencil art. Everything is for sale, by the way, including the originals! 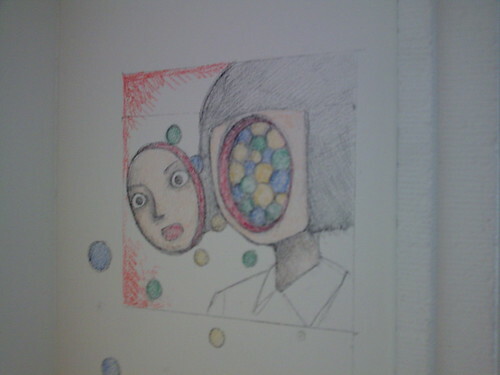 Kago also made about five small crayon 'murals'. He came out to talk to and pose for fans, dressed in a robe." Looks like poster-sized color pieces, from the same set as the Vice Magazine cover. Concentric circles and psychedelic inner-worlds. So awesome. 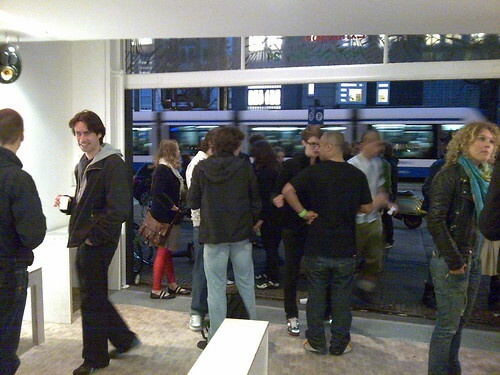 Some of the crowd, facing out at the entrance of the small gallery space. I wonder what this is from? It seems like a commercial spot illustration. 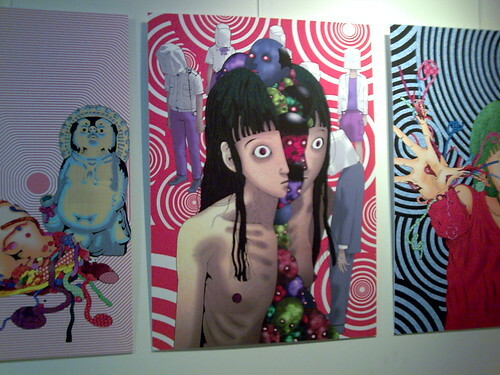 [UPDATE 1]: Kago has posted a few pics of the exhibit on his blog, which you can see here. From his post it sounds like he did some press while there, and was interviewed for an Amsterdam newspaper, etc. [UPDATE 2]: Talked today to Vice's editor-in-chief Jesse over email. He was generous enough to send more than a dozen copies of the Kago issue (as I blogged about before); I'm gonna post soon with the names of folks who we're sending them to- I had to do it first-come first-serve, but I think I'll be able to get copies to the majority of folks who wanted one. 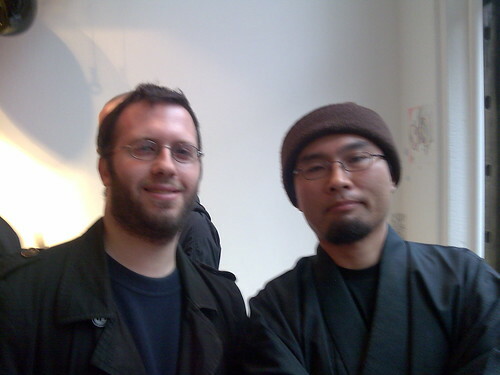 I have to mention too, Jesse told me that while he now is a reader of Same Hat, it actually wasn't the Kago scanlations we blogged about that led them to Shintaro Kago (sorry Anonymous K). Seems the editor of Vice Japan is a deep cuts manga nerd too, and he was the one who pitched Kago's work and the idea of a cover feature, and also helped make the Amsterdam exhibit happen. Great minds think alike, and all that! 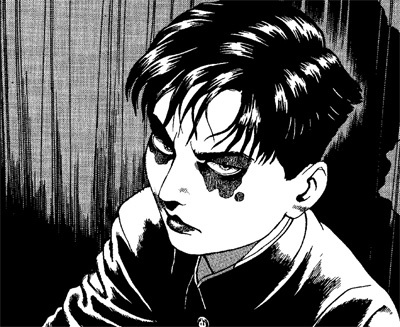 Mr. K, you should still feel proud that you got Kago on the radar of mainstream and/or non-manga folks, like The Comics Journal, Scott McCloud and MC Frontalot, and introduced tons of new fans to his works. 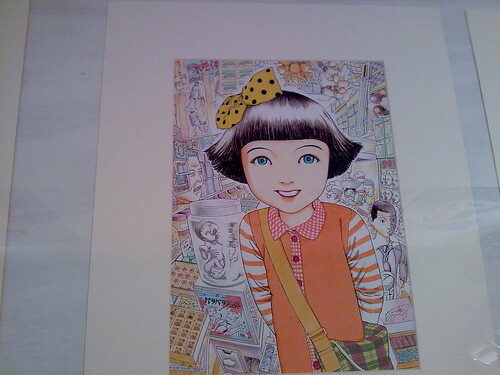 The sixth image: it's also used as the cover of Kago's manga collection Yume no omocha koujou (Dream toy's factory, 2006). The images look amazing! I wish I could be there face to face with them and him. So jealous! i want a catalogue of this exhibition!!! @anonymous: thanks! duly noted in the post. @anonymous k: I know, right! If I talk to the Editor at Vice again I'll mention it, haha. The good news is that I did get copies of that issue from him and am posting about it today. I am putting a copy to you in the mail Monday morning. Will respond to your latest email (and crazy project) soon! Thanks again, dude. You are a legend. @gea*: you and me both, sister. See you at MoCCA, right? but yay that the mags arrived... Am I still on the list? That image for the poster-sized color pieces is just... you're getting your mind blown looking at a girl whose head is exploding. Awesomely insane. @gizmogal: Lucky Dan! I wonder how many SH readers met Kago at this event? I am jealous. @gea: Cool! I just found a nonstop ticket from SFO to NYC for 300 bucks, so I think i'm gonna come out. yay!